Many costs come with buying a home… this one’s on us! We help make the homebuying process easy. And, with our free appraisal, it’s also a little easier on your wallet. 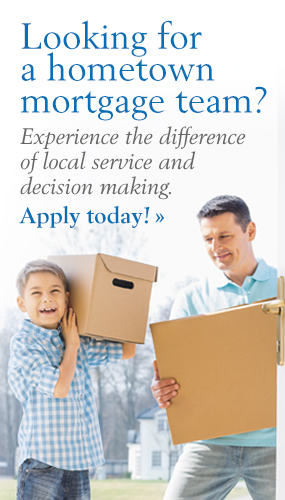 Complete a mortgage application with National Bank of Middlebury. Tell us that you would like to participate in the free appraisal offer. Provide us with the fully executed purchase and sale contract. The appraisal fee is collected upfront to order the appraisal. At closing, up to $475 will be credited to you to cover the cost of the appraisal. As you plan your next move, let us take you step by step through the mortgage process. Call us today at 877-508-8455 to discuss your home buying strategies, or visit our Online Mortgage Center! Offer valid with fully executed purchase agreement dated May 1, 2019 through September 9, 2019. Mortgage applications and sales contracts must be received by National Bank of Middlebury by September 13, 2019. Offer valid for primary residence and year-round second home purchases only, including modular, condominium, townhome and doublewide manufactured homes. Maximum value $475. Credit not to exceed actual cost. Home purchases must be completed by December 31, 2019.